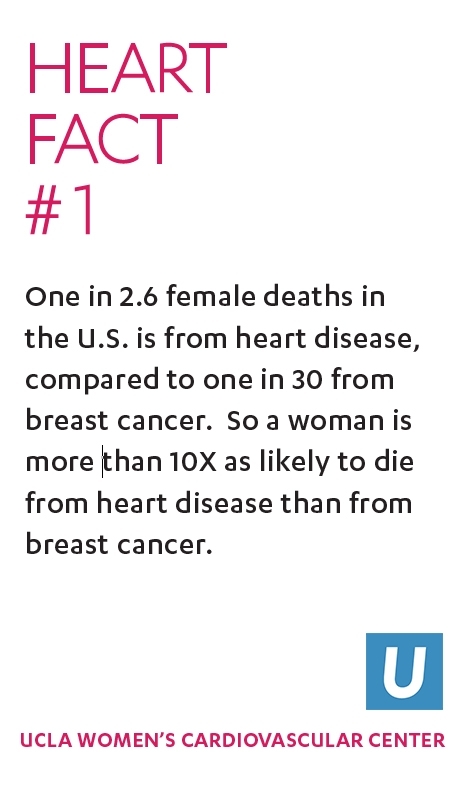 One in 2.6 female deaths in the U.S. is from heart disease, compared to one in 30 from breast cancer. So a woman is more than 10X as likely to die from heart disease than from breast cancer. Learn more about Heart Services at UCLA and the UCLA Women's Cardiovascular Center. I have been a patient at the UCLA Barbra Streisand Women’s Heart Health program for about 5 years. I’d describe the overall clinical experience as “knowledge and dedication to women’s unique cardiovascular needs with compassionate care.” Although UCLA is a huge medical institution, Dr. Karol Watson and her team use an individualized “whole person” (mind/body) approach to patient care, wellness and prevention. Personalized care with all of the resources of one of the country’s best research institutions. Two thumbs up!